When I was a little girl, I was shy and quiet and liked to hide behind my mom. Despite my shyness, however, I loved to act. My sister and I, along with our friends, enjoyed putting on shows for our family in our basement. I participated in a community theatre production as a child and in several plays put on by church groups. I wrote my first play in 1999 when I was fifteen years old. I organized a group of twenty-one other homeschooled children and directed the production that autumn. Each production requires months of planning and preparation, but it is a job I thoroughly enjoy. I love giving homeschooled children the opportunity to participate in wholesome, God-honoring productions. The Homeschool Dramatic Society stands on prayer, and I believe that God's blessing and favor has been on each production. I know that I have been drawn closer to the Father and that my faith has been strengthened through these productions, and year after year it has been my prayer that the same would be true for the other cast members and our audiences. In 2010 I married Nate McCurdy, the man of my dreams. We now have four children. In addition to writing and directing musical productions, I work in curriculum development and graphic design in my family's homeschool curriculum business, Notgrass History. 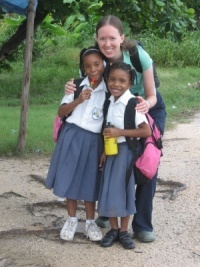 When I visited Corozal, Belize, in June of 2008 to work with a Christian school, I knew that I wanted to go back. I dreamed of taking one of my productions down and directing it with the children of the school. In October-November of 2008, God fulfilled that dream. 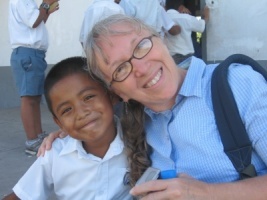 My mom, Charlene, came along as my traveling companion and assistant director and we spent almost four weeks in Belize to work with the children and prepare them to present a concert to their families and the community. The production I chose to do with the children was Sing the Story, which tells the story of the Bible from Creation through Acts. I had to simplify the production a great deal to fit with the Belizean culture and the time we had to work with the children. The end result wasn't exactly what I was expecting, but it was wonderful. I learned to go with the flow and let things happen Belize style! Below is an account of the concert I wrote from the perspective of one the attendees, whom were not expecting, but who made the whole experience more beautifully Belizean! On Friday, November 7, 2008, I was minding my own business as usual, hanging out on the Corozal Community College campus. There were lots of students on campus—the boys in their khaki pants and white shirts, the girls in their white dresses. A vehicle drove up to the back gate beside the auditorium, which is an open-air concrete pavilion with a metal roof. Mr. Chan, the principal of the Corozal Church of Christ Primary School, and two American women got out of the vehicle. If I understood what people were saying correctly, their names are Charlene and Mev. The gate was locked (I could have told them it would be, but no one asked me), so Mr. Chan drove around to the front to ask a security guard to go let the women in. Just to show off to the women, I crawled under a nearby gate that was also locked. There's not much that can stop me. The security guard came to let them in, and the women started to get ready for some shindig they were working on. They had brightly colored posterboard and were cutting big music notes out of them and taping them to the back wall of the stage inside the pavilion. It looked interesting, so I hung around to watch. I helped myself to a plate of something delicious that someone had left on the stage. I'm not sure what it was, but when you're in my place, you learn that food is food and there's no need to ask questions. You see, there are lots of my type running around Corozal: skinny, scrawny, ribs sticking out, not much to look at. The humans leave most of us to fend for ourselves. When a bag of Alpo is $85, though, I guess I can't say I blame them too much. Somewhere along the way I picked up a blue collar. Most of the other fellas don't have anything half so nice. Mr. Ake, one of the primary school teachers, soon arrived with giant posterboard letters: S-I-N-G-T-H-E-S-T-O-R-Y. They put those up with the music notes. It looked pretty neat, if you ask me. Now, I didn't know exactly what to expect from this here concert. I was down near the primary school earlier in the week (no one saw me, but I was there), and I had seen these kids practicing in the school yard. Lots of the kids were undisciplined and unruly and it didn't look to me like they were anywhere close to ready to perform anything for anybody. I heard that Mev was praying for a miracle, and she was serious. She said that if the concert was like the rehearsals, it was going to be bad—really bad. She was praying hard. I was curious to see how it would all come out. Now back to Friday. I had heard that the students were supposed to be at the auditorium by 3:30 and the concert was supposed to begin at 4:00. Mr. Chan really wanted to begin on time. The students started arriving, cute little kiddies in their school uniforms of white shirts and grey pants or skirts. Now, let me explain something. One thing some Americans seem to have a hard time understanding is that Belize is in a time zone all its own. It's called Belize Time. Things don't start when they're supposed to start. Somebody's always got to be late, and usually no apology or anything of the sort is needed. It's just the way it is. I knew this concert wasn't going to start at 4:00, but I kept my mouth shut. The students kept trickling in, along with some parents and siblings and other people. At 4:00 the sound system had arrived in a pickup truck and was being set up. Children and their families continued to arrive. At 4:20 the children were still arriving. The Church of Christ preacher and his wife weren't there yet. Charlene and Mev were pretty surprised. He had stressed to the church how important it was for them to come and support the event and they were surprised that he wasn't there himself. No need to worry, I wanted to tell them. It's early! He and his wife showed up at 4:30 and had plenty of time to get a seat before things got started. The concert began around 4:35 or 4:40. It started with a prayer and the singing of the Belizean national anthem. Mev introduced things and the children came out on stage. 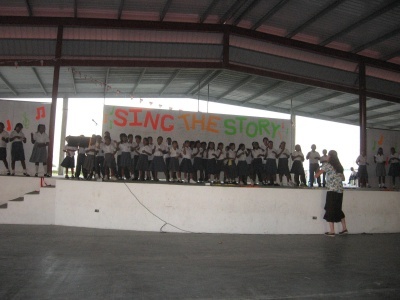 Not knowing how many of the children were going to show up to perform (remember, this is Belize), Mev and Charlene were pleased with the turnout. The rough estimate was about 90 kids, and about the same number in the audience. Maybe up to 200 people in the auditorium all together. The concert continued in the laid back Belizean style. No need for the stuffed shirt, prim and proper atmosphere. I heard that Mev does productions with children in the States and sometimes she gets kind of uptight, hoping everything will turn out all right. Maybe this experience will help her relax a little bit. The kids were cute and did a nice job. The soloists and small groups of singers sounded great and the girls who did the ribbon choreography looked really good. It was pretty loose and free. Some of the boys who showed up but didn't want to perform had been told to sit in the audience, but Mev saw them on the basketball court beside auditorium while the concert was going on. At one point I was curious to see what the audience looked like from the stage, so I trotted up and joined them for a bit. It was kind of exciting up there. Mev didn't really mind that I went up. She thought it just made the whole thing more Belizean. Another Belizean flare was that the first soloist just so happened to be one of the children who didn't show up, but Mev and Charlene hadn't noticed that. When it was time for that song, lo and behold another boy stepped up to the microphone. They're not sure if a teacher told him to or if he just volunteered, but there he was. He hadn't practiced singing that part one time, as far as the Americans knew, and he was one of the particularly difficult children to handle, but the song started and he actually did a really good job! Some parents donated refreshments to sell at the back and that brought in some extra money for the school. I was hoping for some good leftovers, but they sold everything except some Coke and Fanta and glass bottles are hard to open when you're a dog. From the looks of things it was a really good experience for these kids. The music teacher at the community college is an American, and I heard him tell Mev that to pull something like this concert off in Belize is pretty rare. Mev and Charlene looked like they were pleased with results. I don't blame them.